Coached by Dave Darnall, the Eureka College men's basketball team won the NAIA Division II national tournament for the first time, finishing the season with a 27-6 record, the best record in school history. This team is only the second team in the history of all NAIA colleges from Illinois to win a title in the NAIA National basketball championship. The Red Devils were the NAIA II undefeated Conference Champions. The team also was the Wabash Tournament Champions and was undefeated at home during the regular season. Eureka finished sixth in the final NAIA II national rankings and then went 6-0 in post-season play. In the final NAIA II statistics Eureka was first in team rebounding percentage (60.9), first in team scoring margin (22.65), second in 3-point field goal percentage (49.1), third in team scoring defense (64.65), and 10th in field goal percentage (51.2). 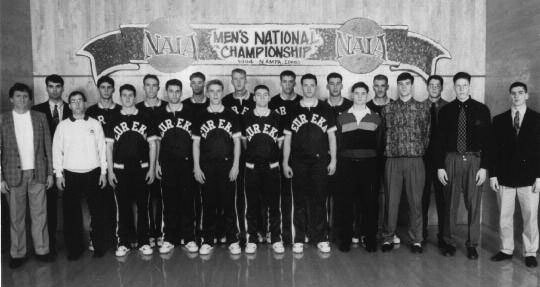 Individually, Chris Eaton was NAIA II Player of the Year and was a first team NAIA all-American, while Chris Peterson was named MVP of the national tourney.